A frequently asked question about FireWire repeater hubs is "do I need the optional power supply?" The answer to this question depends on the types of FireWire 800 or FireWire 400 devices are being used. Bus Powered FireWire devices draw current from the FireWire bus itself. FireWire hard disk drives using 2.5in mechanisms are typically able to use bus power. 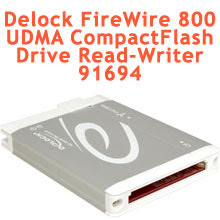 Our CFFire800 Pro FireWire 800 UDMA CompactFlash reader requires bus power. Portable devices like the Apogee Duet require bus power as well. Often computer companies will list ports by watts, instead of amps. When a company lists Watts for their FireWire ports, divide it by 12 (FireWire is typically 12 Volts) to find the Amperage. The calculation above are the worst case scenario, typical application rarely see devices drawing current of each port. 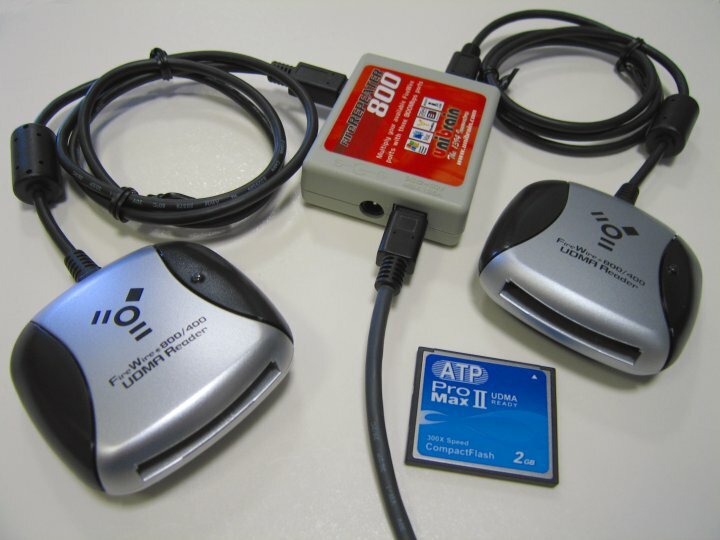 A notible exception was the CFFire800 Pro FireWire 800 UDMA CompactFlash reader with Unibrain's 3 Port FireWire 800 Hub. We've tested this off a powered Mac port and were able to run two CFFire800 Pro's without the addtional power supply. Here is a quote from our test results. While our CFFire800 Pro uses FireWire bus power, we knew it draws less than 500mA, while the MacBook Pro provides just under 1A of current while running on batteries. 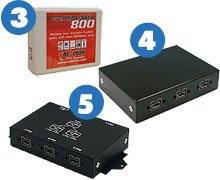 One product we offer, Unibrain's extremely portable FireRepeater 800, splits source current between two ports. With that in mind we set out to test two CFFire800 Pro readers with FireRepeater 800 to see if it provided enough power off a single FireWire 800 port to enable both CompactFlash readers; we found it worked flawlessly. 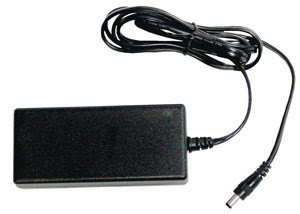 This versatile adapter provides up to 3A stable regulated 12V DC output. For use with Unibrain Fire Repeaters, Fire-i Digital cameras and Unibrain FireWire External Hard Drives. It provides power for FireWire devices on laptops that do not provide power through the FireWire ports and can provide additional power for devices connected in an extended link to desktop systems. How handy is this photo? It sure makes a lot of prose unnecessary. 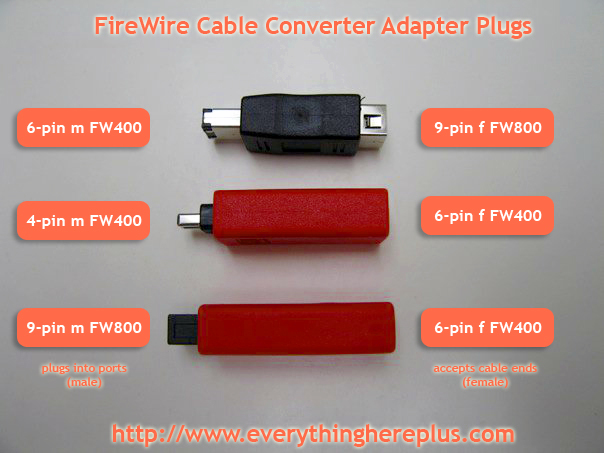 These adapters cover just about any FireWire 400 or FireWire 800 conversion scenario one could think of. Converter plugs for FireWire cables allow changing the cable plug type at the very end to match that of the port it's being plugged into. For FireWire 400 (IEEE 1394a) ports, there are converter plugs allowing 9-pin cables to plug into 6-pin ports and converter plugs allowing 6-pin cables to plug into 4-pin ports. For FireWire 800 (IEEE 1394b) there is an adapter plug allowing 6-pin cables to plug into 9-pin ports. EverythingHerePlus.com recently announced a first draft of a document which outlines the use of the BSD and Linux compatible USB reader for PCMCIA PC Card SRAM and ATA Flash memory devices. While the draft isn't complete, experienced users will have no problems using the command line instructions to complete tasks. They tested the device with OpenBSD and Xubuntu Linux. 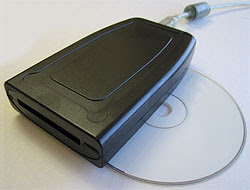 Elan's U111-M PCMCIA PC Card reader for SRAM and ATA Flash memory devices is unique in that the reader itself brokers all the interfacing with the PC Card and presents itself to the host computer as a USB mass storage device. In addition to working on The Windows platforms, the device works with various versions of BSDs and Linux. Because of this, the U111-M allows users of Unix-like platforms to perform actions on these cards using common command line tools that usually require specialized and expensive software for The Windows. EverythingHerePlus hopes the document will be helpful to those wanting to deploy the U111-M with Unix-like systems.